Pianist/composer/arranger Amina Figarova was born in Baku, Azerbaijan, met her husband Bart Platteau (flute) 2 decades ago and they settled in the Netherlands. They formed the Amina Figarova Quintet, now a Sextet, and have released 12 CDs since 1994. They have now settled in New York, an event that spurred her latest recording, 2011's "Twelve" (In and Out Records). Her music reflects the influence of composer/musicians such as Herbie Hancock and Chick Corea with arrangements that have the airiness of the work of Maria Schneider. Her "European" Sextet has featured the elegant tenor and soprano saxophone work of Mark Mommaas. The Amina Figarova Sextet comes to Firehouse 12, 45 Crown Street in New Haven on Friday June 7, the penultimate presentation of the venue's Spring 2013 Concert Series. The ensemble features the pianist, her husband, Mommaas plus 3 Americans; the rhythm section consists of bassist Joe Sanders (Ravi Coltrane, Gerald Clayton) and drummer Justin Brown (Rudresh Manathappa, Pascal Le Boeuf Trio - see below) plus the fine young trumpeter Josh Evans, a native of Hartford, CT. When I interviewed Dave Douglas prior to his Firehouse 12 gig, he was effusive in his praise of Evans's playing and demeanor. The Sextet will play 2 shows - 8:30 and 10 p.m. - for ticket information, go to firehouse12.org or call 203-785-0468. To find out more about Ms. Figarova and her music, go to www.aminafigarova.com. The Uncertainty Music Series welcomes Jonathan Moritz's Secret Tempo Trio to Never Ending Books, 810 State Street, in New Haven Saturday June 8. Moritz, a native of Teheran, Iran, moved to Southern California as a young boy. He studied at the Royal Conservatory of Brussels, Belgium (where his Father was living) and returned to the US to get his BFA at the California Institute of the Arts. He, then, moved with his wife and family and has worked with a slew of creative musicians. The Secret Tempo Trio finds the tenor saxophonist in the company of bassist Shayna Dulberger and drummer Mike Pride (all pictured above left). Moritz has worked with both musicians in the past but this is their first endeavor as a trio. They have a new recording scheduled to be released soon on Hot Cup Records. The music they create is steeped in the tradition of classic Tenor Trio (see Sonny Rollins) but also has a modernist bent. The Secret Tempo Trio hits the stage at 8 p.m. For more information, go to uncertaintymusic.com. To hear Jonathan Moritz and his various groups, go to www.jonathanmoritz.com. Pianist/composer/educator David Ake has released an impressive sextet date, "Bridges" (PosiTone Records); having listened to the music, at least, 6 times over the past month, Ake's songs and arrangements bring Andrew Hill and Charles Mingus to mind. Not that he imitates them in any way other than to blend and blur the lines between genres as well as composition and improvisation. What a band! The rhythm section consists of Scott Colley (bass) and Mark Ferber (drums) while the "front line" boasts Ralph Alessi (trumpet), Ravi Coltrane (tenor saxophone) and Peter Epstein (alto saxophone). Epstein and Ake are on the faculty of the University of Nevada/Reno and have recorded with the fellow faculty member Chris Clark on his recent "Cedar Wisely" recording on Songlines as well as being 2/3rds of the chamber-jazz trio EEA whose CD "The Dark" was issued in 2011 on Origin Records. The title track opens the recording and, by the time the musicians have worked through the piece, the listener knows this will be one of the more special albums of this year (or any year.) The melody and harmony lines move like a flock of geese across the sky (sans the "honking). Throughout the program, traditional roles are overthrown. On "Sonomads", it's Colley's bass that moves the piece forward and whose phrases everyone else builds off of. Ake's piano holds the "bottom" while Ferber's drums join the conversation with the bass and Alessi's trumpet. The trumpet leads in "Story Table", then the band joins, the melody split among the reeds and trumpet. Ferber, Colley and Ake execute the "stop-start" rhythm with aplomb, nudging the piece forward. The sly, slippery, rhythms on the opening of "Dodge" give way to a accelerated bass line then back for Coltrane's forceful solo. In the middle of the tune, the piece stops for a muted trumpet-piano-drums conversation that is a sparring session for Alessi and Ferber while Ake plays a rhythmical solo. The program closes with a short lyrical trumpet-piano duo titled "Light Bright" that lives up to its name. Gospel and blues informs "Year in Review" - listen to the piano solo as Ake strides, pounds, trills, plays "in" then "out", in the fashion of the late Jaki Byard. If you like creative music that takes chances, where the musicians play with both wit and fire, and where the compositions are so much more than mere heads to string solos upon, "Bridges" will more than scratch your itch. David Ake is leaving Reno for Cleveland, Ohio, where he will be the head of the Music Department at Case Western Reserve University. One hopes he finds enough time to create more music as stunning as this. 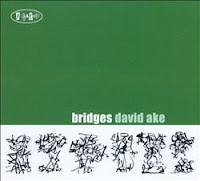 For more information, go to www.davidakemusic.com. Pianist Pascal Le Boeuf who, with his identical twin brother Remy (saxophones), has led a quartet for the past decade playing jazz all over the world. He has also formed a piano trio with bassist Linda Oh and drummer Justin Brown; their debut CD, "Pascal's Triangle" (Nineteen Eight Records), has just been issued. If you like Jason Moran's Bandwagon or Gerald Clayton's Trio, this is a recording for you. 8 tracks in under 33 minutes, none longer than 5:13 but you will walk away from this experience wanting more. Le Boeuf is a melodic player, facile but able to convey emotions, he allows these songs to breathe. Plus, he's got a monster left hand. When he lays down a bass line, like the one on "What Your Teacher...", Ms. Oh is free to create counterpoint or accentuate the slippery rhythms. His chordal work on ballads, such as "Song For Ben Van Gelder" and "Jesse Holds Louise", creates space for the bass lines that float around the piano. Brown is a drummer who truly knows his role; he instigates the soloists, his cymbals frame several of the melodies. He's an inventive player as he displays on "The Key" where he supports the opening melody lines with some funky hand-drumming. His "dancing" drum work on "What Your Teacher.." is irresistible, so buoyant and quite danceable. "Pascal's Triangle" is a delight from start to finish, so contemporary yet with subtle bows towards Keith Jarrett and Bill Evans. Judging by his sparkling present-day accomplishments, Pascal Le Boeuf has such a bright future. He'd be wise to keep Ms. Oh and Justin Brown in the mix - they are his equals and make him work harder to create an individual sound for their ensemble. Hear for yourself by going to pascalleboeuf.bandcamp.com/album/pascals-triangle. Happiness should ensue.